While the Bee Gees reinvented themselves for the disco era, The 5th Dimension called for the return of Jimmy Webb, the youngster who single-handedly wrote and produced their first album Magic Garden. But it was not to be. Webbs advice for singles Magic In My Life and Walk Your Feet In The Sunshine, composed by Webb, failed to chart well. Earthbound became the last album by the original quintet of Billy Davis Jr, Marilyn McCoo, Florence La Rue, Lamonte McLemore and Ron Townson. It was also to be one of the last Jimmy Webb produced albums. 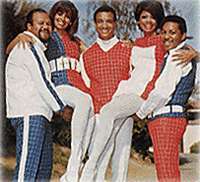 It seems the 5th Dimension wanted to come back on this album as a harmony group since their last two albums Individually & Collectively and Living Together, Growing Together had seen them singing more solos. The distance of time, however, suggests it was the audience that had changed rather than any drop in quality material or superlative performance to account for Earthbounds dismal chart position and sales. Webb offered a collection of songs that emphasised the message of harmony and oneness with nature. The cover art showed the five parachuting onto the earth and instantly taking root. His choice of covers was eclectic. There was George Harrisons album track Be Here Now, possibly the only time it was ever covered, given an ethereal soul spin with shimmering instrumentation. One of the Beatles final songs Ive Got A Feeling is boosted by Webb to reach new Gospel heights, an innovation that Lennon & McCartney probably never saw. On side two, where all of Webbs compositions reside (except for the single Walk Your Feet In The Sunshine), the Rolling Stones Moonlight Mile is just before the final track, Earthbound (Epilogue). Moonlight Miles quality has always been the tasty licks of Mick Taylor that gives the song its haunting quality. Webb again doesnt disappoint. What sounds like sitars and tubular bells announce the song as the 5th Dimension comes in with a warm harmony. Their voices echo the title repeatedly, to recall Mick Taylors leads. Billy Davis lead vocal shows just why the group was such a competitor to Motown. The two singles picked by Webb was what was requested of him  they both recalled past hits, with strong harmonies and left-of-center melodies. Walk Your Feet In The Sunshine is as happy as the title suggests. A mid-song break has trumpets parp-parping like Sgt Peppers march. Magic In My Life (a non-Webb composition) has one of the girls on solo vocals with the magical 5th Dimension singing together on the chorus. Of the two sides, Webbs side with the two pleading ballads When Did I Lose Your Love, a Marilyn McCoo solo and Lean On Me Always with Billy Davis taking the lead; plus Speaking With My Heart, Moonlight Mile and the epilogue of Earthbound (which is a soul odyssey) will be the one in demand.